We are passionate about providing our residents with stimulating, fun and interesting things to do, because we realise is vital to health and wellbeing. Our dedicated activities co-ordinator has over 25 years’ experience in elderly nursing and care, and specialises in the delivery of dementia focused therapy as well as a wide range of creative, appealing activities for all tastes and interests. We are unique in running a cognitive stimulation therapy group called OWLS, which has been signposted by Cheshire East Council and Jocelyn Solly House Memory Clinic, a service which no other home in this area provides. We have good relationship with various groups in the community and the local primary school, who come in to visit and entertain at events. 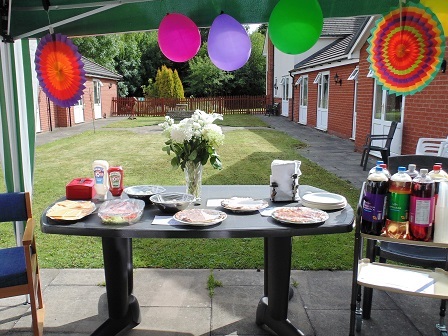 We encourage a close relationship with relatives of our residents, and enjoy holding fetes, events, and parties, fro all to socialise and have fun. Taking residents out for walks and to local beautyspots and areas of interest is an important part of life here at Heliosa and we try to support residents going out as much as possible. If residents have their own tablets even better, as we can arrange Skype/Messenger to be set up allowing them to keep in touch with loved ones from afar. We would hope that residents living at Heliosa come to think of it as their home, and staff who care for them as extended family. We pride ourselves on involving family members in our daily activities and giving residents as much choice and independance as possible, to enable them to live a good quality life, as close as possible to how their lives would have been in their own homes. There are no restrictions on visitng times and we ensure that relatives are invited to events and kept up to date with what is going on at the home. A life history is always taken on admission so that staff can reallyunderstand life from the perspective of the resident and have compassion and empathy for their situations. We believe that knowing someone well is key to ensuring that their wants and needs are met, and for providing the best standard of care they could possibly wish for. Regular bus services offer good access for visitors. There are several local taxi firms on call including a disability adapted transport taxi. Congleton is well provided for with churchs of all denominations and regualr servcies of worship are invited to the home. There’s a lot to figure out when it comes to care home costs. Pop in for a visit and we will be happy to talk it over. Call our care home manager to arrange a visit. Here at Heliosa we have been delivering the best quality care for over 20 years. Copyright © 2018. Heliosa Care and Nursing Home. All rights reserved.